I had heard about Shimizu from Yoshizumi-san who had raved about it. He explained that it was one of his favorites in Tokyo, with an extremely skilled (and serious) taishō serving very classic Edomae sushi with fantastic rice and very high quality neta. Sounded right up my alley. But if you google "Shimbashi Shimizu" you will find virtually no reviews or write-ups from non-Japanese. Why? Well, Shimizu has very specific reservation policies that make it nearly impossible for foreigners to dine there. He will not take bookings from hotel concierges, nor will he accept bookings from non-Japanese speakers. You must speak Japanese, and have a local phone number. And you can only book one week... (or is it two days?)... ahead of time. These policies are in place to insure that regulars have easy access to the counter, and that people are able to dine there on a more "spur of the moment" fashion as compared to other popular sushi shops who require bookings many months in advance. 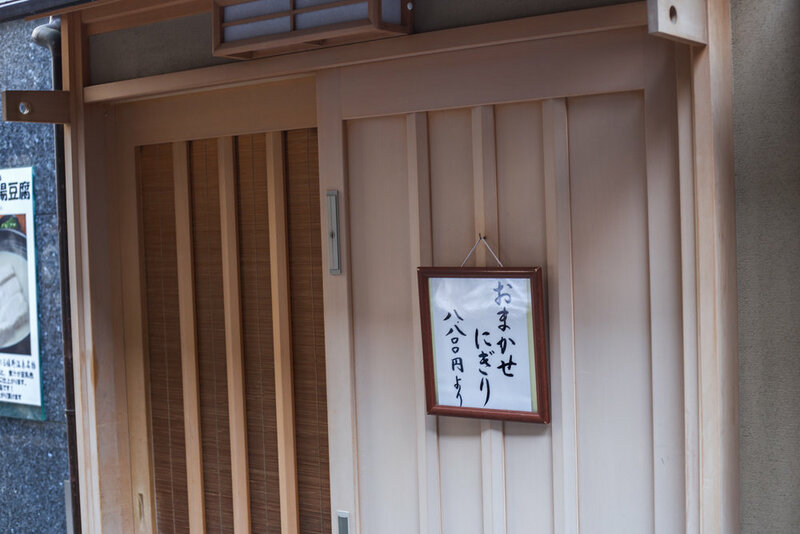 It also insures that the vast majority of the customers will be fluent Japanese speakers who can interact with the taishō - an important aspect of dining at a sushi counter. This made it sound all the more interesting to me, so I asked my friend who is a semi-regular there to try to book a seat for me, but even then Shimizu would not accept the booking. I would need to have a Japanese chaperone go with me. So my friend kindly asked one of his buddies, a Tsukiji seafood broker who is a regular at Shimizu, to accompany me. After arriving at Tokyo station I enjoyed a leisurely 25 minute walk to Shimbashi and met up with my lunch companion in front of the shop. We ended up having a massive, two hour long lunch, with plenty of tsumami and maybe 20 pieces of nigiri. Total bill with drinks was ¥39,000 (about $370) - an absolute steal considering the quality. I LOVED Shimizu's rice: nicely sour, good akazu flavor, a little salty but not too much. I would describe his rice as... refreshing! Nigiri pieces were quite a bit bigger than typical, very much classic Edo style. Every piece was delicious but highlights included a lot of in-season shellfish: hamaguri, tairagai, akagai, etc. Also delicious early season katsuo for tsumami, a very nice BIG piece of karei, and his tuna (from Sado island, I think) was wonderful too. Overall it was delicious, and ranks up there as one of the best meals I've ever had. The atmosphere in the shop is pretty relaxed as most of the customers appear to be regulars. It's a very nice counter - not overly stuffy or quiet like some Ginza places. Shimizu-san is definitely serious, but he seems to have a good sense of humor too, although I had very little interaction with him as his English is at about the same level as my Japanese (i.e. nearly nonexistent). I didn't take photos of the meal other than sneaking a quick iPhone picture of the counter; this was not the type of environment where taking many photos would be appropriate. And besides, I was quite happy to chat with my lunch companion and enjoy the wonderful food. After the two hour long feast my new sushi buddy kindly drove me to Tokyo station, and off to the airport I went, completely stuffed and in a state of peaceful happiness.